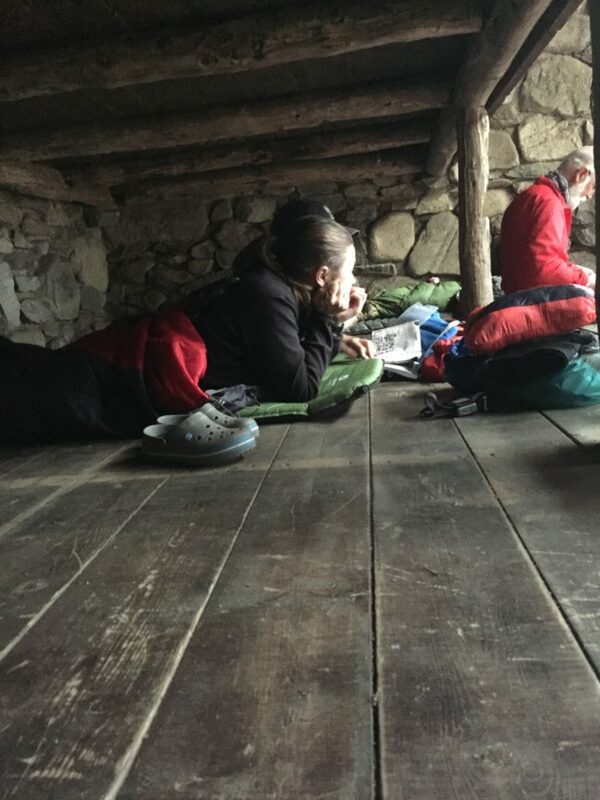 Most of the thru-hikers I’ve talked to were not huge fans of the Smokies. 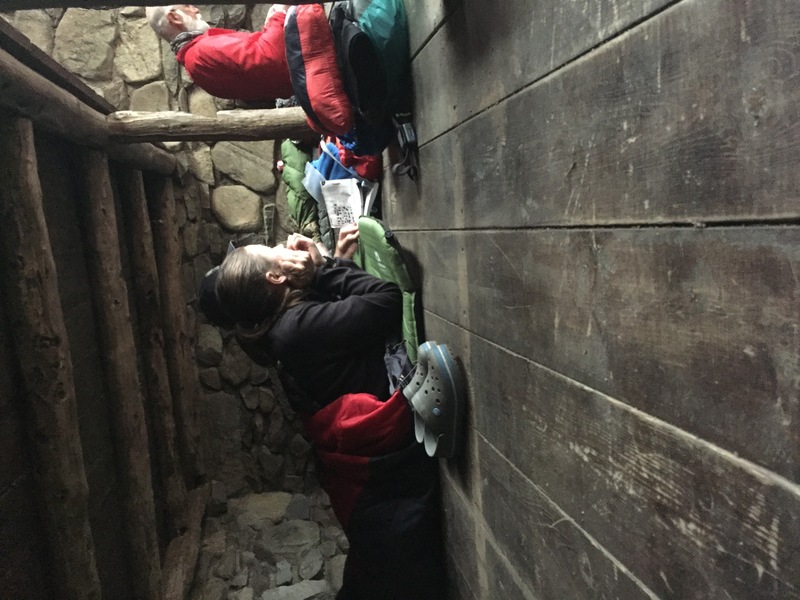 The requirement to stay in the shelters makes it hard to plan reasonable mileage days and puts you at odds with section hikers when there’s not enough room. 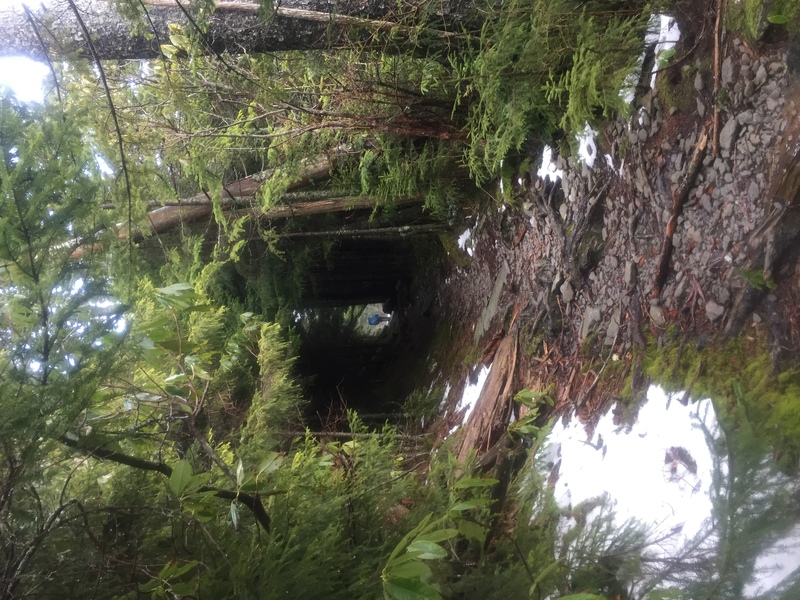 The weather is frequently terrible, and some hikers were basically traumatized by the fierce winter storm that came through. If there are beautiful views, I don’t think I saw any of them. 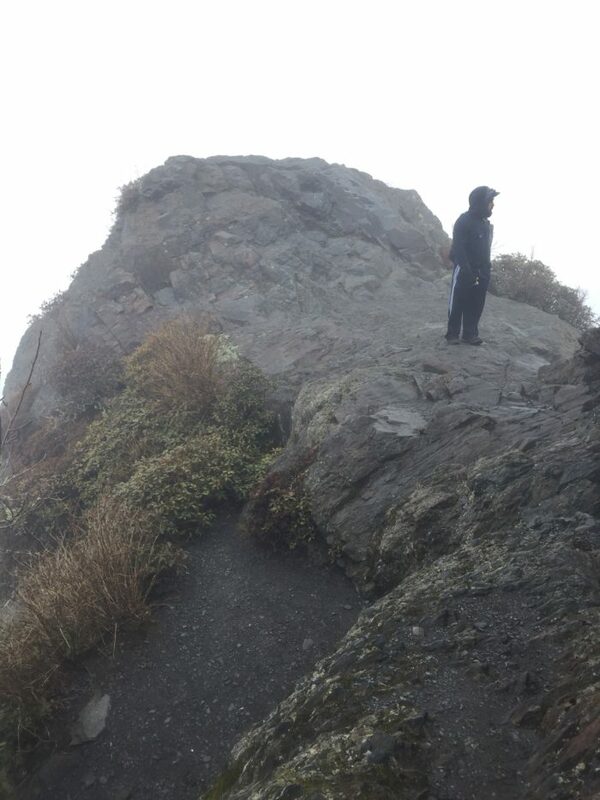 From Charlies Bunion. Supposedly a beautiful view. I actually kind of enjoyed the Smokies. In some ways, I got really lucky with the weather and with shelters. True, I didn’t see any views until my last day in the park. But my zero day in Fontana meant that the worst of the snow was gone by the time I got there, and we only had one really terrible storm. And what the Smokies lacked in views, they seriously made up for in the most gorgeous forests I’ve seen on trail so far. 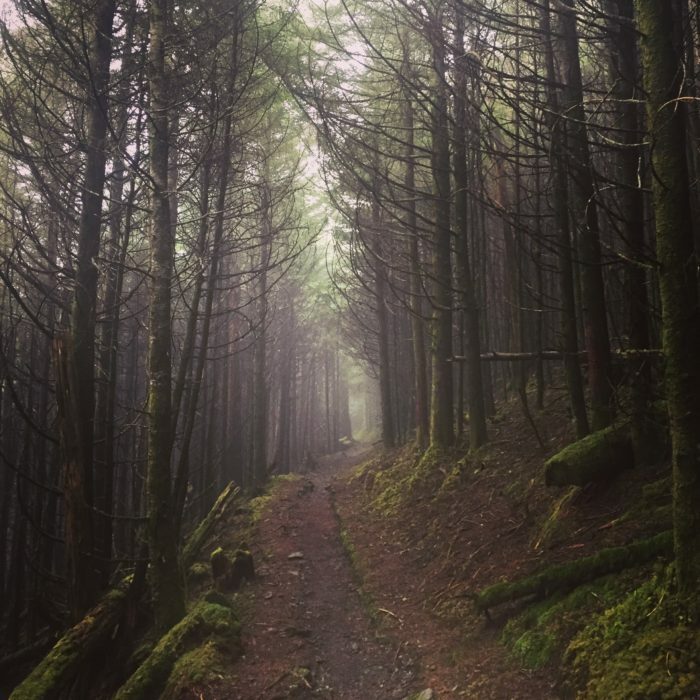 We haven’t seen much green on the trail yet, but everything in the Smokies was covered in lush green moss, and the pine forests are seriously stunning. Like for real, though. I was entranced. 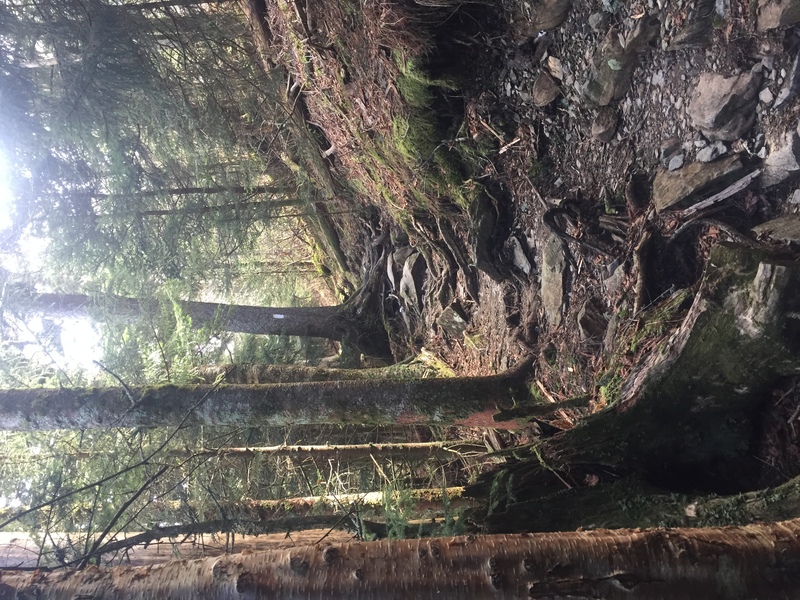 So, here’s a quick rundown of my five days in the Smokies. Day one: I started back where I left off about a mile before the Fontana Hilton. I’m a little sad I didn’t get a chance to stay there, but as nice of a shelter as it is, it still doesn’t have heating. 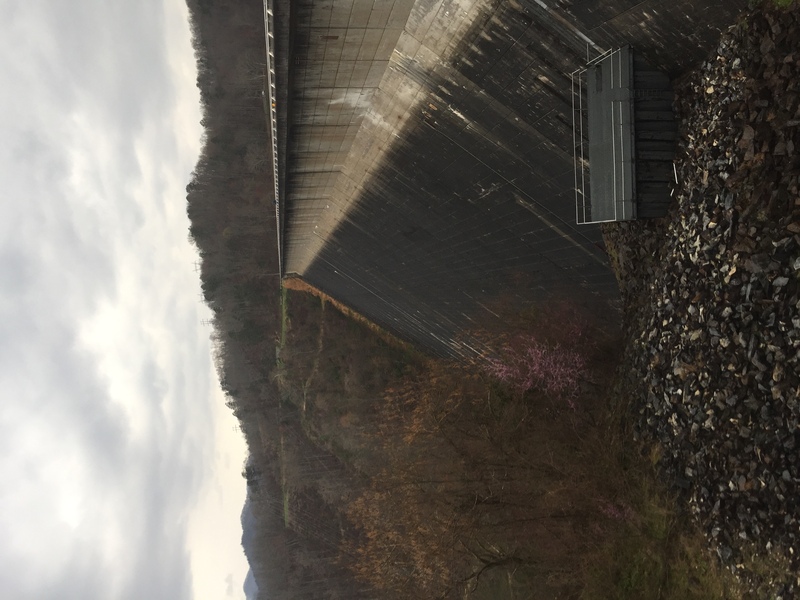 The trail takes you along the road for a while, and across the Fontana Dam, and eventually into the actual park border. 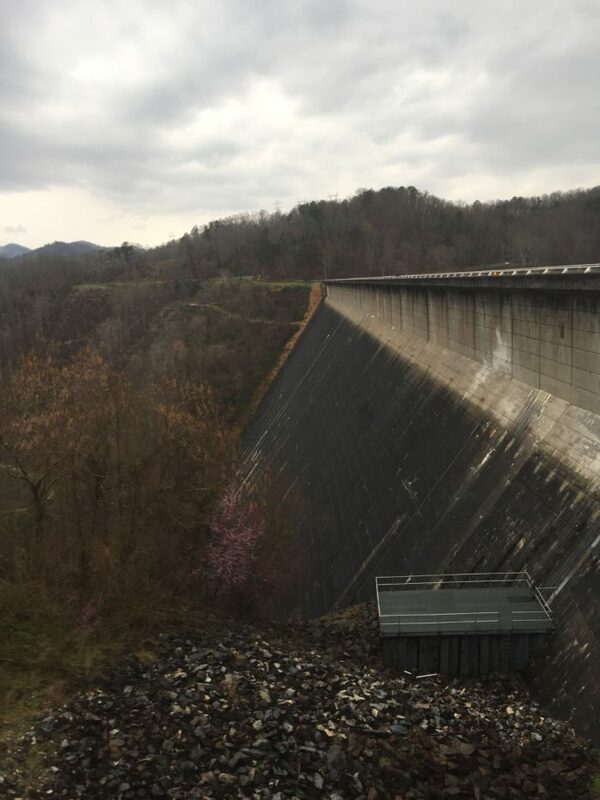 The dam. So much concrete! Entering and exiting the Smokies via the AT is really uneventful. I don’t think they even had a fancy sign declaring it to be Great Smoky Mountains National Park. After that, you basically spend the whole day climbing up to higher elevations. It had been foggy pretty much the entire day, but it wasn’t until I was about a half mile from the shelter that I saw lightning. Luckily I made it in before it started raining and then hailing. Others weren’t so lucky. No one was super enthusiastic about setting up a tent on top of the snow while it was hailing. So in the end, I think about 20 people spent the night in this 12-person shelter. 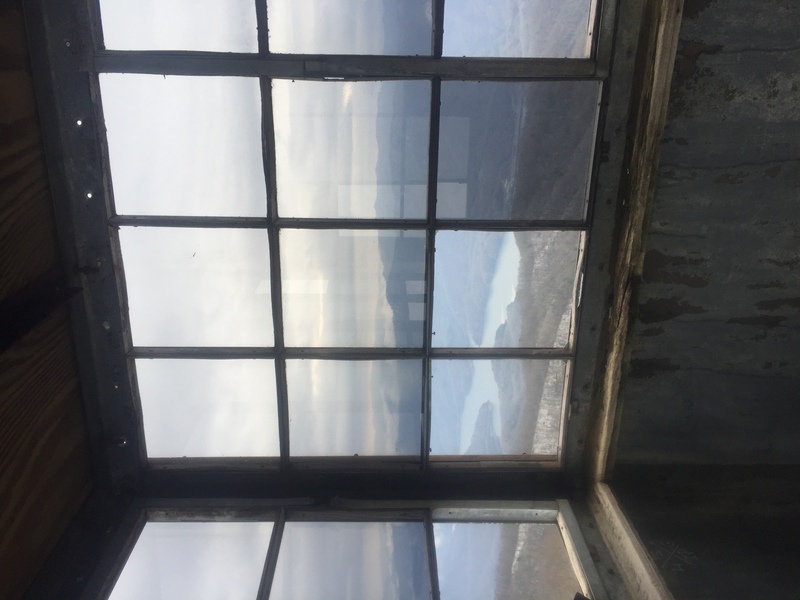 You can see back to the Fontana Lake from this very rickety fire tower. Day two: This was actually my birthday, and my longest day of hiking up to this point at 17.8 miles. The weather again ended up being foggy and wet, and I spent most of my birthday this year walking through the mud, alone. I did summit the iconic Rocky Top, and catch back up with Buck and Robin, who had pushed on the night before despite the rain. The shelter was also way less crowded. I learned that hiking with wet socks for ten hours will definitely make your feet unhappy. 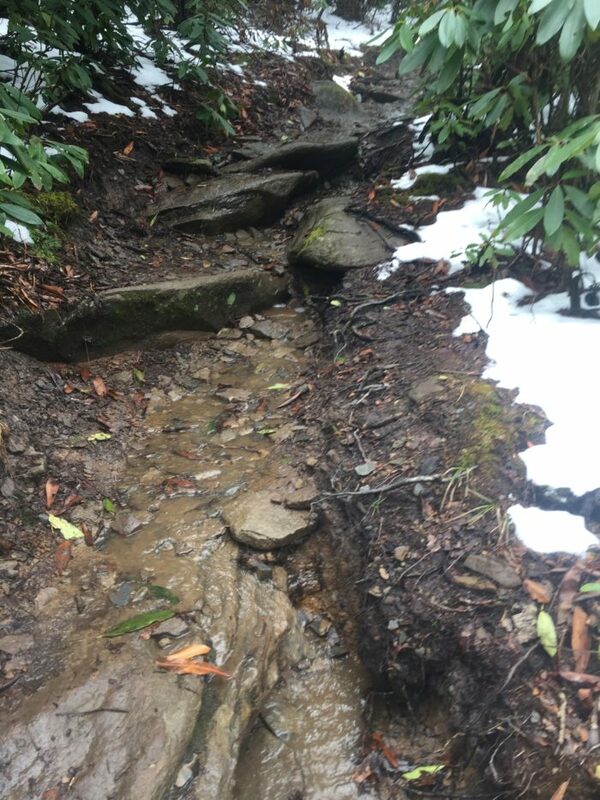 Here’s a picture of the trail deciding it would rather be a stream today. 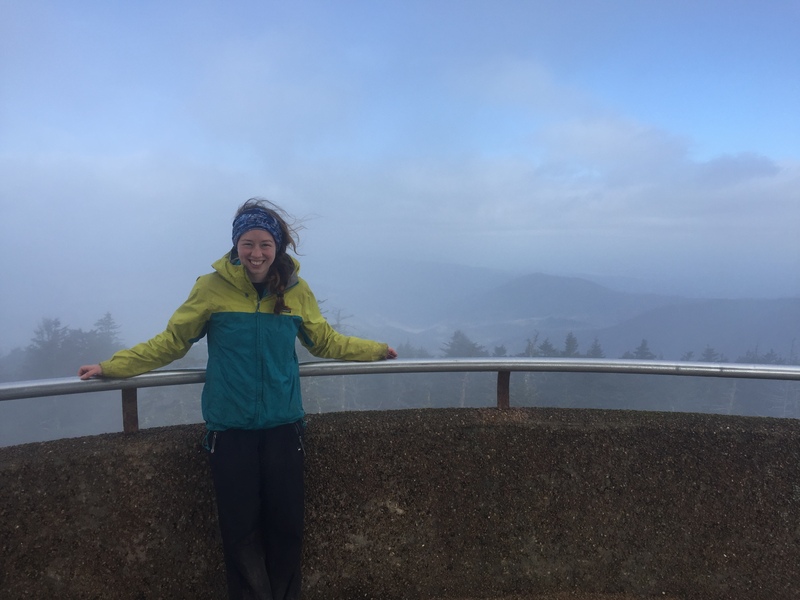 Day three: It was windy as heck all night, and continued into this morning as we went up to Clingmans Dome. 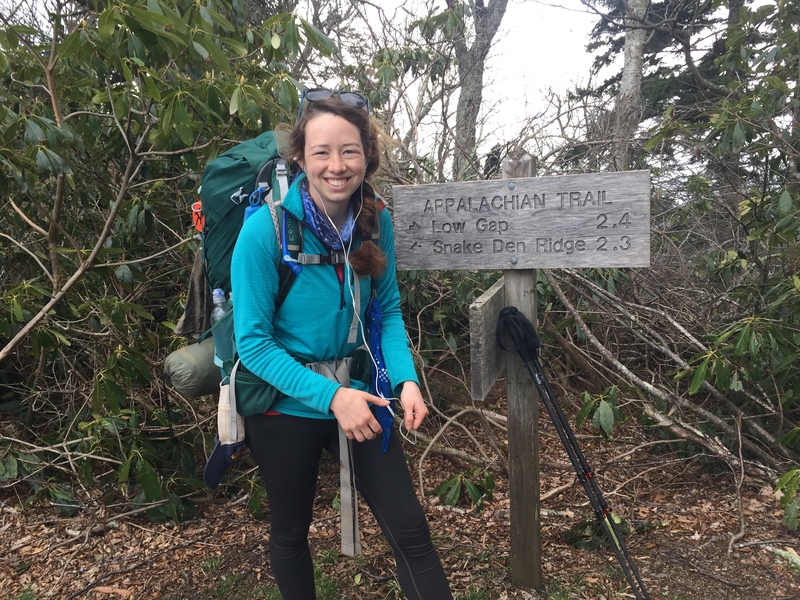 The dome is the highest point on the AT, and is just about the 200-mile mark, so it’s a nice milestone. Despite the crazy wind, it actually warmed up pretty nicely during the day, and we even got sporadic views. From Clingmans Dome. You can kind of see mountains back there, right? What was less nice is that a lot of the leftover snow on the trail had started melting the day before and then refrozen overnight, so the trail down was basically an ice slide. It took forever to get down without sliding everywhere, and as a result of impatience, I fell down like two or three times. Eventually we made it to Newfound Gap, which was a total madhouse. Like, we’d seen some day hikers already, but I was not prepared for a bustling parking lot full of families all hanging out. On the plus side, it wasn’t too hard to find a ride into Gatlinburg. A legit green tunnel! I was getting sick of everything being gray-brown. I had heard that Gatlinburg was basically a cheesy tourist mountain town, and I was so excited because I love a good cheesy tourist town. We didn’t even spend a full 24 hours there, but I’d absolutely go back to visit all five Ripley’s Believe it or Not attractions, the Paula Deen store, and the Dollywood water park. After we found a motel and showered, our first stop was the all-you-can-eat pizza buffet. Once we were uncomfortably full, we went over to the closest resupply store, which had a terrible selection and was ridiculously overpriced. Like $1.30 per pack of (only chicken flavor) overpriced ramen. We left having bought only a corn dog, which Buck got for me as a birthday present since I had been talking about how much I wanted one. (Thanks Buck!) Instead, we braved two trolley rides and an Uber to get to an actual grocery store, which was absolutely worth it. Unfortunately, we did not have time for the moonshine tasting. Day four: We left Gatlinburg early and got increasingly sad as we drove up into the mountains and it got increasingly foggy and rainy. I spent a good chunk of the morning on the phone with Fontana Lodge, having realized right before getting into Gatlinburg that I left my wallet there. I hadn’t needed it before then, so it took me three days to notice I didn’t have it. Thanks to some help from Buck, Robin, Honey Bear, and Sweet Tea, and the power of Venmo, I got through Gatlinburg OK and was able to get my wallet sent to Hot Springs. So really, it could have been way worse, but still more stress than I’d rather have to deal with. Town days are the worst for losing things. On an ordinary day, if I left anything behind as I was packing up, it would still be sitting on the ground as I was leaving. Makes it easy to see if you’re missing anything. Thankfully I just have to keep track of myself. Day five: Technically we didn’t actually exit the Smokies this day. We stopped at the shelter about a mile within the border. But since it took us all of 20 minutes to walk out the next day, I’m considering this the last day of the Smokies. Just in time for us to be nearly done, we actually had beautiful weather. It was warm and sunny, we could actually see mountains instead of fog, and it was mostly downhill. Basically, an ideal hiking day. The sun makes me happy. Since the shelter we stayed in is right at the edge of the park, it was also basically empty. It’s also the only shelter I saw in the Smokies without bear cables, so Buck and I got the bear-bag-hanging team back together again. I like to think we’re getting better at it. Robin enjoying the half-empty shelter. So, whatever. The Smokies aren’t that bad. Yes, it would have been nice to look at something other than white fog while on top of some of the highest peaks of the AT. Yes, the trail becoming a deadly ice slide did make it unreasonably difficult to hike sometimes. We also lost Squid Kid for the entire Smokies since he didn’t zero in Fontana. 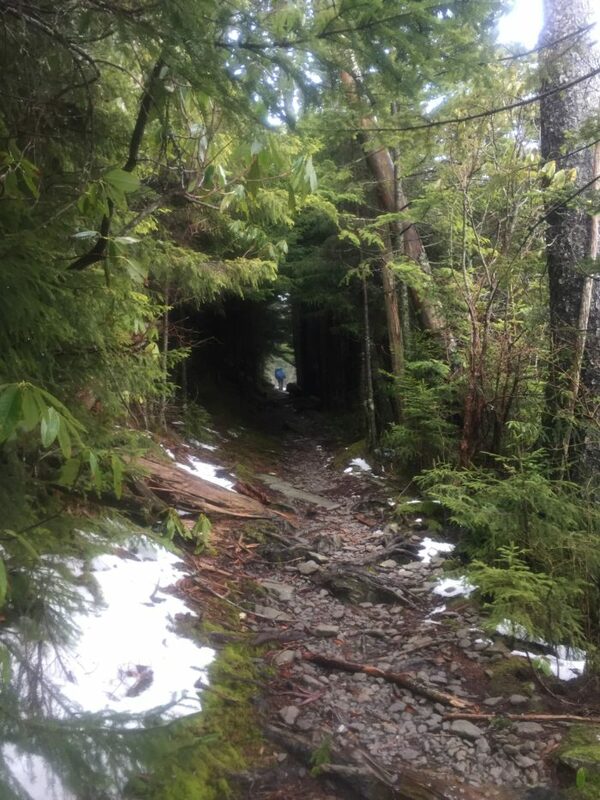 But I did meet quite a few cool thru-hikers in this section, and reconnected with some people I’d met previously. 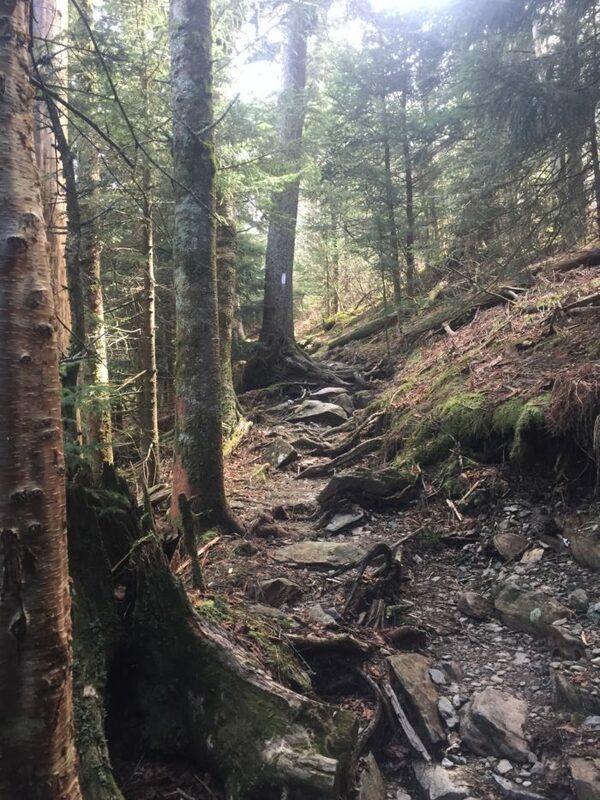 I haven’t seen any forests as crazy beautiful as the ones near Newfound Gap before or since. And I didn’t have to hike through a crazy winter storm like some people did this year. So there you go. At least one thru-hiker enjoyed the Smokies. 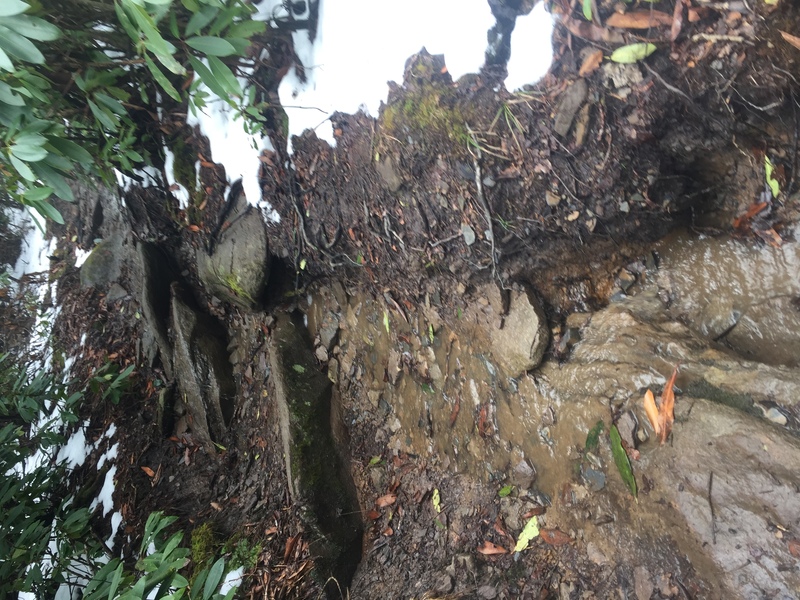 You 18ers have had a rough winter and early spring on the AT. But truth is, the Smokys are not uniformly brutal. I had snow, hail, fog and wind during my 2016 thru, but most days were sunny and clear. 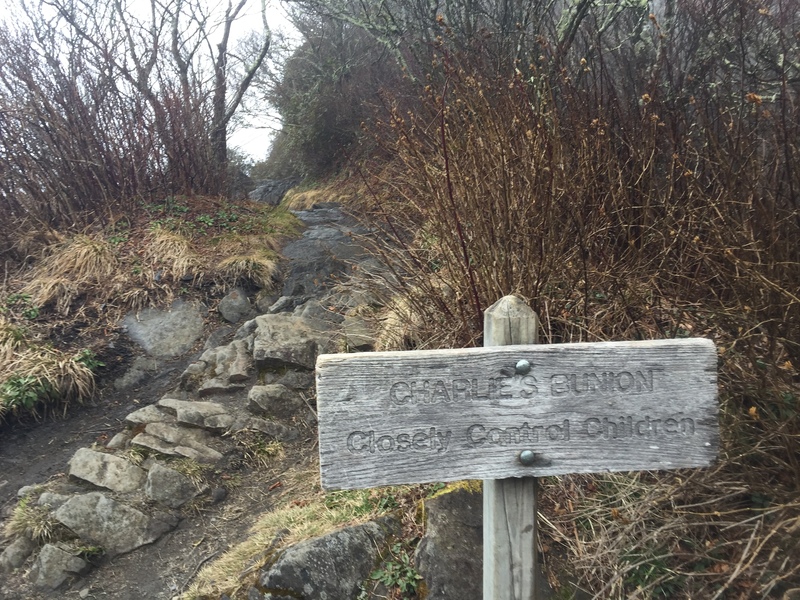 I had great views, for the most part, except for Charlie’s Bunion. 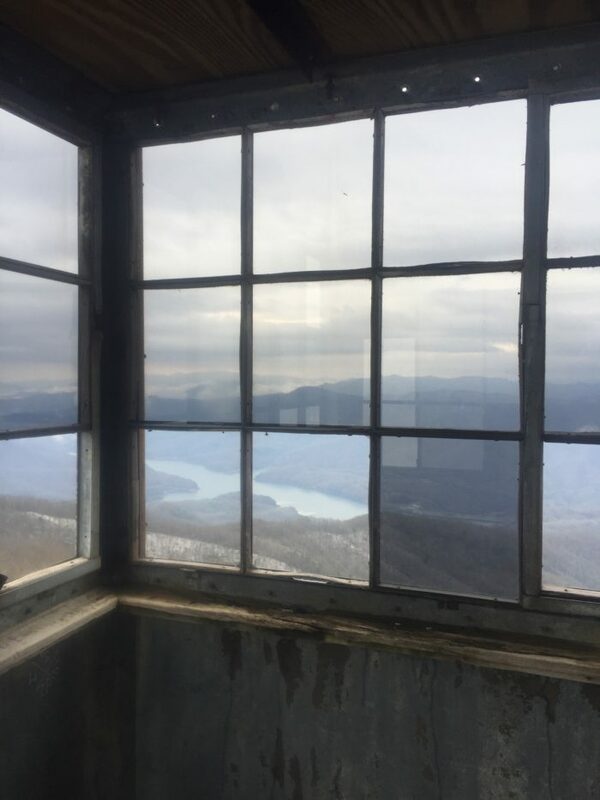 Sometimes I think it’s pointless to talk about what’s “typical” on the AT. Too much terrain, too varied, to make such sweeping statements.